Alaska Governor Frank H. Murkowski and First Lady Nancy Murkowski announced the honorees of the 40th annual Governor's Awards for the Arts and Humanities, sponsored by the Alaska State Council on the Arts and the Alaska Humanities Forum. "It is fitting that the 40th annual Governor's Awards for the Arts and Humanities is being held at the same time as the Alaska Federation of Natives annual convention," Murkowski said. "So much of what we are here to celebrate tonight reflects the immense breadth and beauty of Alaska Native culture and tradition. Nancy and I would like to pay our debt of gratitude to all of you who are being honored tonight, and thank you all for reinforcing the message that the arts and humanities are vital to a blooming community and state. "We are richer for your service and all Alaskans should be thankful for your efforts in broadening our horizons and showing us the many ways and things that make our state so unique and sometimes mesmerizing. We have the luxury of a large and varying area with diverse peoples who all have their own arts and cultures to study and acknowledge," Murkowski said. "We are truly a better state thanks to your work." The following awards were announced Friday, October 27, 2006 at the Anchorage Marriott Hotel. Individual Artist Award: Ray Troll, Ketchikan - Ray moved to Ketchikan in 1983 and has become one of Alaska's best-known artists. 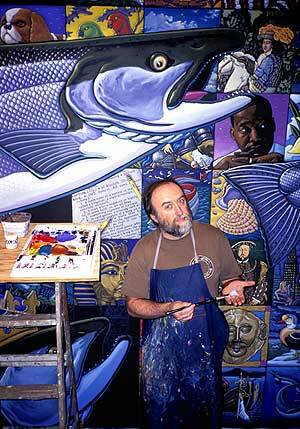 He is also involved in many arts and culture projects in Ketchikan and throughout SE Alaska. Arts Business Leadership Award: ConocoPhillips Alaska - Since 2000, ConocoPhillips Alaska has contributed almost $7 million to arts and culture programs in Alaska. Arts Education Award: Janet Stotts, Palmer - Conductor and founder of the Anchorage Children's Choir, Janet has been teaching music in Alaska since 1980. In 1996, Janet was the recipient of a Woman of Achievement Award presented by the YWCA. Arts Organization Award: UA Museum of the North, Fairbanks - The museum has undergone a major successful recent expansion, but continues its mission of research, outreach and education. Margaret Nick Cooke Award for Native Arts & Languages: Susan Malutin, Kodiak - Susan is a dedicated teacher of the Alutiiq heritage and culture in Kodiak. She also has reawakened the art of Kodiak Alutiiq skin sewing. In 2003 she received the AFN President's Award for tradition bearer. Arts Advocacy Award: Sen. Gary Wilken, Fairbanks - Gary has been a champion of the arts for many years in the State Senate, including public funding for the arts and the Percent for Art program. Native Artist Award: Anna Brown Ehlers, Juneau - Anna is a traditional Tlingit master weaver, whose work is featured in collections around the world. Since 2000, she has received three prestigious First People's fund awards. Alaska History Teacher of the Year Award: Brenda Campen, Sitka - Brenda is a teacher at Mt. Edgecumbe High School and has taught Alaska History and Alaska issues for almost thirty years. She was instrumental in the development of the Alaska History and Cultural Studies course and its standards. Distinguished Service to the Humanities Award: Dermot Cole, Fairbanks - Dermot is a longtime columnist for the Fairbanks Daily News-Miner and has written extensively about Alaska and Alaska history for thirty years including authoring a number of books on subjects ranging from the Trans Alaska Oil Pipeline to the history of Fairbanks. Distinguished Service to the Humanities Award: Dr. Terrence Cole, Fairbanks - Terrence, a longtime history professor and Director of the Office of Public History at the University of Alaska Fairbanks has authored a wide variety of books on Alaska history and is a specialist on the Nome gold rush. Distinguished Service to the Humanities Award: Perry Eaton, Anchorage - Perry grew up on his father's fishing boat in Kodiak and has made significant contributions to the humanities in Alaska through his work as artist and community development professional specializing in rural Alaska, and as the founding President and Chief Executive Officer of the Alaska Native Heritage Center. Distinguished Service to the Humanities Award: Dr. Edna Ahgeak MacLean, Barrow - Edna has devoted many years as a protector of Alaska Native languages and cultures through her work as the former President of Ilisagvik College in her hometown of Barrow and numerous publications about Inupiaq language and culture.